← Who are you calling disgusting? Try Kersten’s Kitchen FB page, lots of great gluten/dairy/soy free recipes, if you don’t mind a little time in the kitchen. Suitable for food intolerance too. 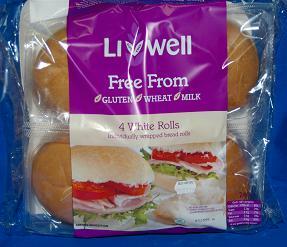 I tried some commercial GF bread the other day and agree, it was gross. Kersten’s recipes make it decent though. Oh gosh, that sounds even worse than this sawdust bun incident! Thanks for the link – am checking it out now! Highly recommend makign your own – it’s not as hard as you’d think. I use Laucke gluten free bread mix from the gluten free section and love it! Zehnders bread (http://www.zehnder.com.au/ made in Maleny Qld and sold frozen) is awesome. My coeliac son loves it. I noticed that it is sold in Tasmania. He also loves the Simply Wiz bread mix. That Living Well stuff is terrible – twice I’ve bought it and it was mouldy. What a waste. I adore Burgen but they don’t have a gluten free range that I’ve seen? I have seen the Schar but haven’t tried it yet!